There is something about old wooden boats that has always intrigued me. Its like they still hold a promise for the future, though tenuously as age creeps up, a promise for laughter, happy times and children scampering about their decks. Perhaps those are just the memories engrained in their planking and clipped paint, a reflection of past times that we all long for when we were young and carefree and were not entombed with the latest and greatest technical devices. Old wooden boats had no GPS systems to make you feel perennially in control of reaching your destination. They had a compass, a sextant, a chronometer and a navigational chart on paper or linen, all the tools needed to chart a true course and reach your Shangri-La and relish in the risk. Oh that we could go back in time and recapture those days! 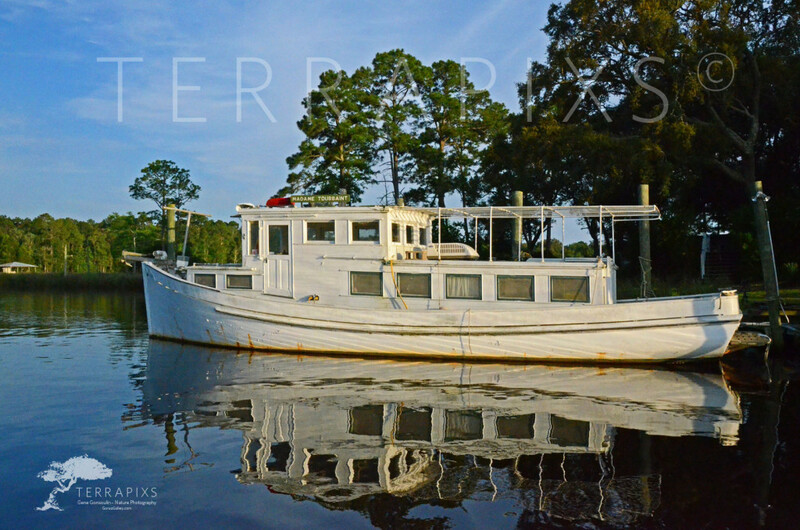 I first saw Madame Toussiant while sightseeing on the upper reaches of Soldier Creek just off of Perdido Bay on the Alabama side. Coming around a sharp bend and through tall salt marsh grass and pines I saw her, tied to an old dock whose pilings leaned this way and that. It was late in the afternoon, the sun was low and casting shadows. Her lines struck me a beautiful, the proud bow turning up still, her gunwale gracefully sweeping back. I fell in love with her immediately and took many more pictures than I needed, but she didn’t seem to mind. Several months later I went back and my heart sank. She was gone. To my great relief I later learned she had been donated to an organization whose sole purpose is to provide sanctuary for old wooden boats. I plan to see her again soon. I hope she remembers me. Enjoy!